Make an Old or Scratched table look like new with a Bevel Mirror Table Topper. When the ordinary won't due, Beveled Mirror Table Toppers are the answer. Truly a contrmporary classic look with a brilliant 1" bevel edge. 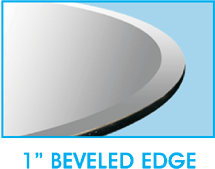 Bevel mirror tops compliment every type of decor. Easy to care for.... Just wipe with a soft cloth and glass cleaner. 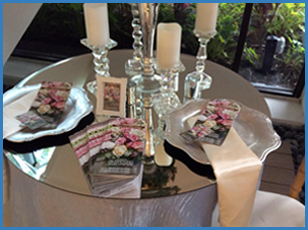 Bevel mirror table toppers add class and elegance to any setting. Great for parties , entertaining, and events. Glass Tops Direct offers the largest selection of bevel mirror table toppers, glass table tops, and table protectors in all sizes delivered free to your door.